Objectives In disease modifying antirheumatic drug (DMARD)-naive early rheumatoid arthritis (RA), to compare the efficacy of methotrexate (MTX) and infliximab (IFX) with MTX and intravenous corticosteroid for remission induction. Methods In a 78-week multicentre randomised controlled trial, double-blinded to week 26, 112 treatment-naive RA patients (1987 American College of Rheumatology classification criteria) with disease activity score 44 (DAS44)>2.4 were randomised to MTX + IFX or MTX + single dose intravenous methylprednisolone 250 mg. A treat-to-target approach was used with treatment escalation if DAS44>2.4. In the IFX group, IFX was discontinued for sustained remission (DAS44<1.6 for 6 months). The primary outcome was change in modified total Sharp-van der Heijde score (mTSS) at week 50. Results The mean changes in mTSS score at week 50 in the IFX and intravenous steroid groups were 1.20 units and 2.81 units, respectively (adjusted difference (95% CI) −1.45 (−3.35 to 0.45); p=0.132). Radiographic non-progression (mTSS<2.0) occurred in 81% vs 71% (OR 1.77 (0.56 to 5.61); p=0.328). DAS44 remission was achieved at week 50 in 49% and 36% (OR 2.13 (0.91 to 5.00); p=0.082), and at week 78 in 48% and 50% (OR 1.12 (0.47 to 2.68); p=0.792). Exploratory analyses suggested higher DAS28 remission at week 6 and less ultrasound synovitis at week 50 in the IFX group. Of the IFX group, 25% (14/55) achieved sustained remission and stopped IFX. No substantive differences in adverse events were seen. Conclusions In DMARD-naive early RA patients, initial therapy with MTX+high-dose intravenous steroid resulted in good disease control with little structural damage. MTX+IFX was not statistically superior to MTX+intravenous steroid when combined with a treat-to-target approach. The Infliximab as Induction Therapy in Early Rheumatoid Arthritis (IDEA) study was a randomised controlled trial (RCT) in DMARD-naive early RA to compare the efficacy of MTX and a tumour necrosis factor (TNF) inhibitor with MTX combined with intravenous steroid therapy as remission-induction followed by a treat-to-target approach. MTX + Infliximab (IFX) was chosen as the biologic combination given the short-term and long-term clinical and radiographic efficacy data at the time of study design.10 ,13 MTX with intravenous steroid was chosen as the comparator—intravenous steroid for its rapid onset of action, potential impact on endothelial adhesion molecules as seen with TNF inhibitors,18 and ease of blinding versus IFX. Given that clinical remission is associated with varying degrees of subclinical disease and subsequent structural progression, 19 and the study was open after 26 weeks, an objective primary outcome of structural progression was chosen. Eligible patients were aged 18 to 80 years, fulfilling the 1987 American College of Rheumatology (ACR) classification criteria for RA, between 3 and 12 months symptom duration, with active disease (DAS44>2.4) and DMARD naive. Exclusion criteria included any prior DMARD, corticosteroid use within 1 month prior to baseline, concurrent pregnancy, planned pregnancy within 24 months after screening, serious infections within 3 months or opportunistic infection within 6 months of screening, documented HIV infection, hepatitis B or C serology positive, important concurrent medical conditions or relevant comorbidities, history of lymphoproliferative disease, or other malignancy within the previous 5 years (except squamous or basal cell carcinoma of the skin, treated with no evidence of recurrence). Tuberculosis screening was carried out prior to baseline in accordance with local recommendations. This was an 18-month multicentre, randomised (1:1), double-blind, parallel-group, phase 4, superiority study designed by regional rheumatologist consensus and conducted at four sites in West Yorkshire, UK (Leeds, Huddersfield, Harrogate and Bradford). Patients were randomised to one of the two groups: infliximab (IFX) or intravenous steroid. After obtaining patient consent, the research nurse telephoned a contact at central pharmacy independent of the recruitment process for allocation consignment. Subject numbers were assigned according to a block randomisation programme generated using random number tables, stratified by site. Both groups received MTX 10 mg weekly increasing to 20 mg or maximum tolerated dose by week 6, and folic acid 5 mg daily except the day of MTX. During the first 26-weeks, patients, clinical staff and assessors were blinded to treatment allocation. During this double-blind phase, all patients received infusions from visually identical 250 mL bags over a 2-h period. The IFX group received: IFX 3 mg/kg (maximal dose 1000 mg) standard regime (weeks 0, 2, 6, 14, 22). The intravenous steroid group received intravenous methylprednisolone (MP) 250 mg at week 0 and placebo infusions at weeks 2, 6, 14, 22. Disease activity was measured at weeks 0, 6, 14, 22, 26, 38, 50, 68 and 78. 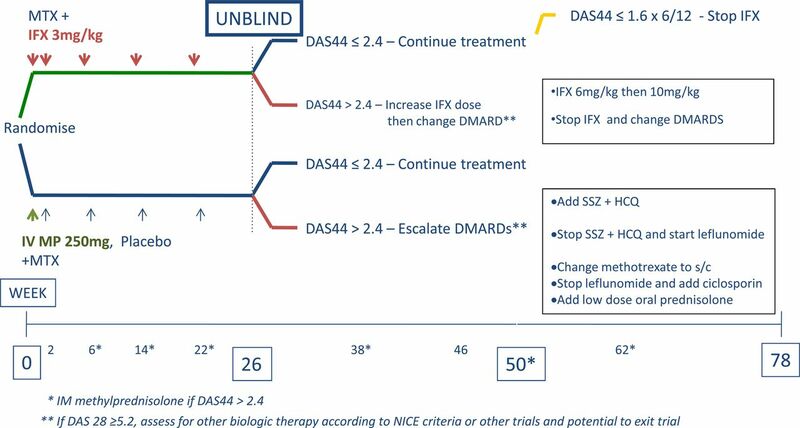 From week 26, during an open label observation period, patients continued therapy according to a pragmatic predetermined study escalation protocol with dose adjustment or DMARD change in the IFX group, and DMARD escalation in the intravenous steroid group if DAS44>2.4 (figure 1). Study design. **DMARD escalation protocol: sulphasalazine(SSZ) 500 mg daily increasing to 1 g twice a day over a 4-week period + hydroxychloroquine(HCQ) 200 mg – 400 mg daily to a maximum of 6.5 mg/kg, then stop SSZ + HCQ and add leflunomide (LEF) 10 mg daily for 1 month, then increase to 20 mg daily, then one of the following: subcutaneous (s/c) methotrexate (MTX) + LEF or MTX + ciclosporin 2.5 mg/kg/day or MTX + LEF + prednisolone 5–7.5 mg daily. IFX infusions were withdrawn if patients taking IFX were in sustained remission (DAS44<1.6) for 6 months at all consecutive visits, if patients withdrew from the trial for whatever reason, or at study endpoint (78 weeks). Patients who withdrew from therapy who were willing to attend for further clinical assessment continued follow-up according to the original visit schedule. Osteoporosis prophylaxis was administered at the treating physician's discretion, guided by local guidelines. The primary outcome was the change in van der Heijde modified total Sharp score (mTSS)21 at week 50. Secondary radiographic outcomes included the changes in erosion (ERO) and joint space narrowing (JSN) scores and proportions of patients achieving radiographic non-progression (change not exceeding the calculated smallest detectable change (SDC) for this study, or change <0.5 units22). Radiographs were scored independently by two experienced radiographers, read in time order, blinded to treatment allocation. Secondary clinical outcomes included number of patients achieving clinical remission (DAS44<1.6) and the number in sustained remission (DAS44<1.6 maintained for 6 months), therefore fulfilling study criteria for stopping IFX. Patient-reported outcomes, RA Quality-of-Life questionnaire (RAQoL), Health Assessment Questionnaire Disease Index (HAQ-DI)23 and numbers of patients remaining in paid employment were also calculated. Patient visual analogue scales and early morning stiffness were measured each time clinical data were collected. RAQoL and HAQ-DI were measured at baseline and weeks 26 and 78. The subgroup of patients attending the Leeds clinics had ultrasound assessments for synovitis at baseline, weeks 50 and 78. Assessments were performed by four rheumatologists trained in musculoskeletal ultrasound with good inter-reader and intrareader reliability (data not shown). Findings in 22 joints (bilateral wrists, proximal inter phalangeal joints 2 and 3, metacarpophalangeal joints 2 and 3, and metatarsophalangeal joints 1–5 were compared between groups. The EULAR-OMERACT scoring system (unpublished) using a 0–3 semiquantitative scale was used to score synovitis with respect to grey scale and power Doppler. The clinical investigators were unaware of the ultrasound findings. Posthoc clinical outcomes included 3-variable DAS28 remission (<2.6) and remission according to the 2010 ACR/EULAR criteria ((swollen≤1, tender≤1, C-reactive protein (CRP) mg/dL≤1, patient global assessment (PGA) cm≤1) or simplified disease activity index (SDAI) remission (≤3.3))24; low disease activity (DAS44 (≤2.4) and DAS28 (≤3.2)); ACR 20/50/70 responses25; the number of patients in clinical remission (DAS44<1.6) at 78 weeks no longer on infliximab/placebo infusions; duration of biologic free remission in patients able to stop biologic therapy early (loss of this state was defined by DAS44>1.6, an increase in DAS44 of 1.2 or any change in disease activity requiring an increase in therapy)26 and differences in steroid requirements in each group. Posthoc regression analyses were also conducted in a subset of patients, to assess the association between baseline factors and outcome at 78 weeks (annualised radiographic progression; clinical remission (defined by DAS44<1.6)). At each visit, patients were asked to report new adverse events (AEs). Clinical and laboratory AEs were recorded using standard, medical terms. The study was powered to detect a significant difference in damage progression observed in the two treatment groups, measured by the mTSS, assuming progression in each group would be comparable with that observed in the Behandel-Strategieën (BeSt) study13 which allocated 508 patients with early RA to one of four treatment arms. The change in mTSS in the IFX-MTX combination therapy (mean 1.3, SD 4.0) and step-up combination therapy (mean 4.3, SD 6.5) arms were used to power this study, as these were thought to best reflect the magnitude of expected response. With 80 percent power to detect a difference at a two-sided significance level of 5%, 56 patients per group were required, assuming the use of non-parametric statistics may be necessary if the primary outcome were severely skewed. Both efficacy and safety analyses were performed on the set of subjects who received at least one dose of study drug. The primary analysis assigned patients to the groups to which they were originally randomised, and used multiple imputation (MI)27 by chained equations to account for missing data. A sensitivity analysis was conducted which included only patients with data available (complete case). Additionally, a per-protocol analysis was performed. Analyses were conducted in Stata 12.1 (details in the online supplementary section). SDC in mTSS was calculated according to the Bland–Altman 95% limits of agreement method. Agreement between the change scores of the two readers was quantified using intraclass correlation coefficients. Values presented are for 3-variable DAS44-CRP (lower limit for CRP=5 mg/L). For patients whose erythrocyte sedimentation rate (ESR) measurements were more complete than their CRP measurements, ESR values were converted to CRP prior to calculation of the DAS, using a published nomogram.28 Continuous interval outcomes were analysed using linear regression with robust SDs and categorical outcomes analysed using logistic regression. In each analysis, we controlled for baseline values and study site. For severely skewed variables, non-parametric quantile regression models were also constructed. The threshold for statistical significance was adjusted for multiple comparisons among the secondary outcomes using the Holm method. No adjustments were made for the exploratory analyses. Descriptive results are presented for harms. For events which recurred over time, only the most severe occurrence was counted for each patient. Both absolute and relative frequencies are presented together with the number of occurrences per 100 patient-years of follow-up. A total of 112 patients were recruited from the four sites in Yorkshire, UK, from September 2006 to July 2009—with 81% from Leeds, the main centre, and the remaining patients from Harrogate, Huddersfield and Bradford. Participants attended for screening (no more than 4 weeks prior to baseline), at the time of randomisation (baseline) and according to the study protocol for 78 weeks (figure 2). Patient disposition. LTFU, lost to follow up; LOE, loss of efficacy; AE, adverse events; SW, self withdrawal; XR, X-ray. Demographic and baseline disease characteristics are presented in table 1. Clinical characteristics between the two groups were similar. The intravenous steroid group had a slightly higher proportion of rheumatoid factor and anti-citrullinated protein antibodies (ACPA) positivity (60.7% vs 49%, and 75% vs 64% in the intravenous steroid an IFX groups, respectively). Baseline mean radiographic scores were also somewhat higher in the intravenous steroid group (mTSS 9.23 (18.31) vs 6.05 (10.83)). The agreement between the two readers’ changes scores was excellent (ICC=0.8). The SDC for this study was calculated to be two units. The baseline JSN, ERO and mTSS scores in the IFX and intravenous steroid groups are presented in table 1. At week 50 (primary endpoint), mean changes in mTSS (ΔmTSS) were 1.20 and 2.81 in the IFX and intravenous steroid groups, respectively, with no significant between-group difference (adjusted difference (95% CI) −1.45 (−3.35 to 0.45); p=0.132) (table 2). Findings were similar at week 50 for JSN and ERO scores and at weeks 26 or 78 for JSN, ERO and total scores. Non-parametric analysis did not alter the overall conclusions. In the IFX group, 61.9%, and in the intravenous steroid group, 46.7% (p=0.116), showed no radiographic progression defined by ΔmTSS<0.5 by week 78 (figure 3). Using the ΔmTSS<2.0 (change <SDC for this study), radiographic non-progression was achieved in 80.6% and 71.0% in the IFX and intravenous steroid groups, respectively (p=0.328). 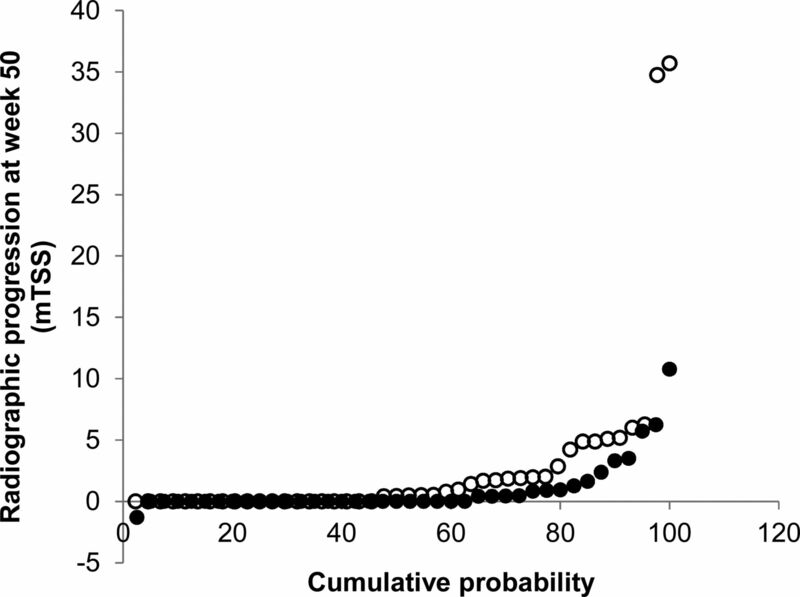 Cumulative probability plot showing radiographic progression at week 50 in patients treated with MTX + intravenous methylprednisolone (open symbols, n=44) or MTX + IFX (closed symbols, n=40). The proportions of patients achieving DAS44 remission did not differ significantly between the two treatment groups at weeks 26, 50 or 78 (table 3). Results of the exploratory outcomes suggested that a greater proportion of patients in the IFX arm achieved low disease activity score 44 (LDAS44) (IFX 46.0% vs intravenous steroid 30.4%; adjusted OR=3.75 (1.46 to 9.62); p=0.006), DAS44 remission (IFX 18.3% vs intravenous steroid 7.1%; adjusted OR=5.02 (1.30 to 19.33); p=0.019), and DAS28 remission (IFX 22.3% vs intravenous steroid 7.5%); adjusted OR=6.16 (1.61 to 23.54); p=0.008) at week 6. 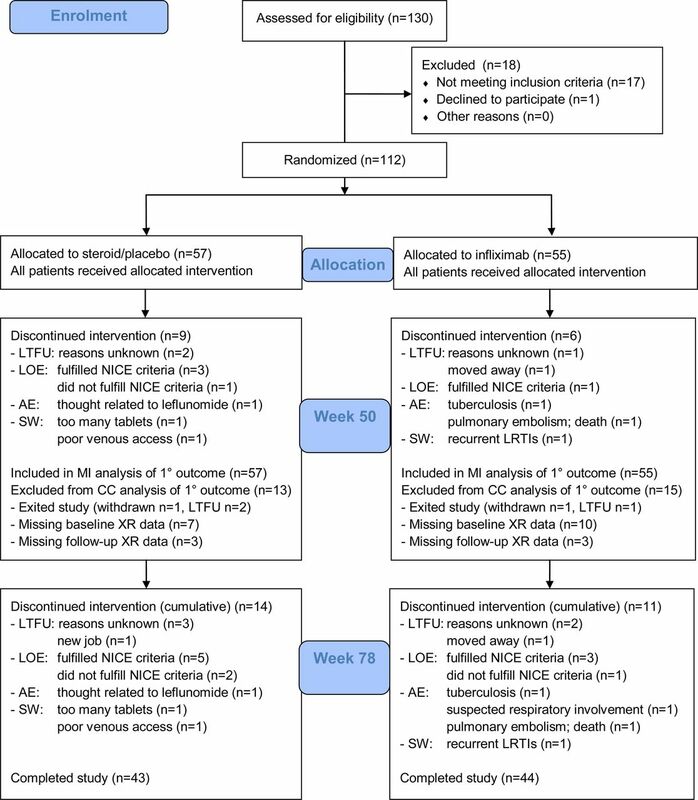 However, by week 14, these differences were no longer apparent, and there were few substantive differences between the treatment groups at weeks the later study time points in the proportions of patients achieving LDAS44, LDAS28, DAS28 remission, SDAI remission, ACR 20/50/70 responses or 2010 ACR/EULAR remission (Boolean definition) (table 3). Sustained remission (DAS44<1.6 maintained for 6 months) was achieved in 37.9% and 30.8% of the IFX and intravenous steroid groups, respectively. Time to sustained remission did not differ substantively between the groups (unadjusted mean 59.27 vs 60.98 weeks; site-adjusted and baseline DAS44-adjusted HR 1.48 (−0.76, 2.87), p=0.251). The results were similar in the observed data, assuming non-response for patients who withdrew early (34.6% (19/52) vs 27.3% (15/55)). Maintenance of sustained remission was determined according to whether patients remained at DAS44<1.6 at subsequent time-points, no evidence of increase in DAS44>1.2, and no changes in therapy. Of the patients who achieved sustained remission in the observed data, flare occurred in four patients in the IFX group (one each at weeks 50 and 62, two at week 78) and three in the intravenous steroid group (at weeks 50, 62 and 78). Of the IFX group, 24.5% (14/55) had stopped IFX due to sustained (>6 months) remission, and 78.6% (11/14) of them maintained remission throughout the remainder of the study period. One patient achieved sustained remission after week 26 but did not stop IFX before week 78 due to an error in DAS44 calculation at week 38, hence, has not been included in this total. The majority achieving sustained remission leading to cessation of IFX did so within the first year (11/14) of treatment, the earliest at week 30 (7.5 months from baseline). Proportions of patients achieving ACR 20%, 50% or 70% responses were similar in the two treatment groups at weeks 26 or 78 (table 3). Approximately half the patients (IFX 46.2%, intravenous steroid 50.1%) achieved an ACR70 response by week 78. Substantive improvement was seen in both groups by week 26 with continued improvement until week 78. At week 78, the mean change in HAQ-DI was −0.85 and −0.79 in the IFX and intravenous steroid groups, respectively (adjusted difference −0.03 (−0.26, 0.21); p=0.826). At baseline, 57.4% (31/54) of those in the IFX group and 57.1% (32/56) of patients in the intravenous steroid group were in fulltime or part-time paid employment. At 78 weeks, data were available for 29 patients in the IFX group who had been in paid employment at baseline, five of whom had retired, and 26 patients in the intravenous steroid group, four of whom had retired. Of the remaining patients, 91.7% (22/24) of those in the IFX group remained in paid employment at 78 weeks, compared with 81.8% (18/22) in the intravenous steroid group (OR (95% CI) 2.44 (0.40 to 14.91), p=0.333). Of the eight patients whose employment status was unknown at week 78, four (1 IFX, 3 intravenous steroid) remained in paid employment at week 62, and one patient in the intravenous steroid group was unemployed at week 62. In patients who remained in paid employment at week 78, there was no difference in the proportion of patients who reported taking sick leave due to their arthritis within the last 3 months (18.2% (4/22) vs 11.1% (2/18); OR 1.78 (0.29 to 11.04), p=0.537). The unadjusted mean additional steroid requirement (total cumulative dose divided by months of follow-up) was 16.0 mg MP/month in the IFX group (n=55) and 21.1 mg/month in the intravenous steroid group (n=57) over the study period (adjusted mean difference −4.96 (−10.31, 0.38), p=0.069). Dividing the study into six 12-week intervals allowed assessment of steroid use at different points in time (see online supplementary table S5). Overall, steroid use was greater in the earlier part of the study. There was some evidence of greater additional IM/IA steroid requirement in the intravenous steroid group between weeks 13 and 26, but during the remaining intervals patients in each group received comparable amounts. In the intravenous steroid group, 55 patients achieved a maximum MTX dose of 20 mg, and two achieved 25 mg. In the IFX group, 53 patients achieved a maximum MTX dose of 20 mg, while one withdrew at week 2 prior to dose escalation, and another was maintained on 15 mg due to abnormal liver function tests during escalation. Proportions of patients requiring additional treatment are presented in online supplementary table S4. In total, 32 in the IFX group (58.2%) and 38 in the intravenous steroid group (66.7%) required a change in their arthritis medication during follow-up. Eighty-nine patients (44 IFX, 45 intravenous steroid) were assessed by ultrasound. Briefly, at baseline, 36/41 (87.8%) in the IFX group and all 39 patients in the intravenous steroid group (100%) who had ultrasound assessments showed evidence of synovitis on ultrasound (GS>1 and PD>0 in at least one joint) . From MI analysis, at 50 weeks 40.5% of patients in the IFX group showed ultrasound disease activity compared with 78.7% of the intravenous steroid group (adjusted OR (95% CI) 0.18 (0.07 to 0.50), p=0.001). At 78 weeks the proportions were 32.2% and 43.6%, respectively (adjusted OR 0.62 (0.24 to 1.58), p=0.314). In seronegative patients, rates of non-progression (ΔmTSS< SDC) at week 78 were 76% and 96% in the IFX and intravenous steroid groups, respectively, whereas in seropositive patients the trend was reversed; with 74% versus 59% in the IFX and the intravenous steroid groups achieving non-progression. We repeated our analyses of the radiographic and clinical outcomes using only the available data (see online supplementary tables S1 andS2) and also analysed the clinical outcomes again assuming non-response in patients who withdrew. Each of these analyses yielded between group differences of comparable magnitude to the analyses of the MI datasets. In particular, adjusted mean change in ΔmTSS according to MI was 1.45 compared to 1.21 in the observed data. In order to test the robustness of our conclusions to conditions under which the data were missing not at random, we altered the imputed values to investigate a range of alternatives. A mean difference in ΔmTSS of three units, the interval used to power the trial, was only achieved when we assumed that patients in the intravenous steroid group with missing 50-week scans progressed by at least 16 units more than the values imputed by the model, while those with missing data in the IFX group retained the scores originally imputed (which ranged from 0 to 11). Of note, however, in the observed data change, ≥16 units occurred in only two patients, with the majority (70%) progressing by <1. In the IFX group, 98.2% (54/55) reported AEs compared with 94.7% (54/57) in the intravenous steroid group: the most common were non-infectious gastrointestinal events (15.7% (58/369) of the events in the IFX group and 18.3% (68/372) of the events in the intravenous steroid group) and pulmonary/upper respiratory infections (IFX 11.3% (42/369), intravenous steroid 13.8% (51/372) table 4). There were 25.3 AEs per 100 patient years in the IFX group compared with 11.0 in the intravenous steroid group. There were 20 serious AEs (SAEs) recorded for 13 patients in the IFX group (23.6%), and 9 events recorded for 9 patients in the intravenous steroid group (15.8%). Admissions for surgical procedures unrelated to the RA or to the study treatment accounted for the higher proportion of SAEs in the IFX group (9.1% (5/55)). One patient in the IFX arm died during the study due to a suspected pulmonary embolus. Serious infections were recorded in two (3.6%) patients in the IFX group and two patients (3.5%) in the intravenous steroid group. One patient in the IFX group had pulmonary tuberculosis, presenting as a pleural effusion and another, an empyema. In the intravenous steroid group, one had a lung abscess and another herpes zoster. No malignancies were reported. To our knowledge, the IDEA study is the first double-blind randomised controlled trial (RCT) comparing two rapid remission strategies in line with modern principles of management of RA using combination therapy with either MTX + IFX or MTX + intravenous steroid in early, DMARD-naive RA with a treat-to-target strategy in both groups. In this study, radiographic progression (the primary outcome) was not significantly different between the two groups. High proportions of radiographic non-progression were seen in both groups, and approximately 50% in both achieved remission at week 78. Treatment benefits were seen in both groups across all aspects of care including function. Comparing longer-term outcomes between these two treatment strategies will be of particular interest and may refine conclusions drawn from the study thus far. The high proportion of radiographic non-progression observed in the intravenous steroid group, similar to that seen in the IFX group, may be explained by two key factors. The intravenous steroid administered initially, which like TNF inhibitors is known to inhibit osteoclastic activity, may have minimised bone damage in the early stages. Subsequent potential for damage in this group is likely to have been reduced by a successful treat-to-target approach, effectively suppressing the inflammation that drives joint damage. A smaller study in MTX-naive RA comparing IFX and intravenous MP without a treat-to-target approach also showed good clinical benefit in both groups but more significant progression in MRI-detected EROs in the intravenous steroid compared with the IFX group.17 In our study, the greater sensitivity of ultrasound over clinical measures of disease activity was shown by the significant benefit seen on synovitis in the IFX group. Although response to MTX monotherapy is well documented in RA patients (20–40%),13 ,29 some still progress radiographically,19 ,30 and a fair proportion require more intensive treatment.13 ,29 The clinical and radiographic responses of this study support the call to treat to target.8 They confirm benefit of MTX and biologic combination therapies in early DMARD-naive RA13 ,14 with the potential for drug de-escalation. Additionally, they demonstrate the benefit of combination therapy with MTX and steroid,16 ,17 ,31 ,32 given here initially as a single intravenous dose. The target aiming to achieve LDAS (DAS44≤2.4) was applied throughout the study. This was similar to several other studies including BeSt,13 OPTIMA33 and SWEFOT29 where treatment decisions were based on whether or not low disease activity was achieved, but perhaps a more stringent target, for example, remission as used in the NeoRACo study34 would have resulted in even better clinical outcomes. The use of intramuscular/IA steroid would also have played an important role in the treat-to-target approach, and in doing so, also minimising the differences between the two groups. The additional intramuscular steroid requirement was marginally higher in the intravenous steroid group compared with the IFX group, suggesting that the MTX + intravenous steroid combination may be somewhat more dependent on regular follow-up and treat-to-target than combination therapy with IFX. In the recently published OPERA study35 comparing adalimumab + MTX versus placebo (PBO) + MTX, IA steroid was used as part of a treat-to-target strategy. No difference was seen in the primary endpoint (LDAS) or ACR20, however, greater improvements were seen at the higher hurdle endpoint (remission, ACR50 and ACR70) as well as DAS28CRP, function and quality of life in the group receiving biologic therapy. Similar to our study, the 12-month cumulative steroid dose was not significantly different between the two groups although there was a trend toward greater use in the PBO group. Potential steroid side effects raise the concerns of high-dose steroid use. Although the boluses of steroid used may appear large (MP 120 mg if LDAS was not achieved at the relevant time points), this is our standard dose used in clinical practice and in the recently reported tREACH study, has shown this to be an efficient way of giving steroid.36 Steroid use in both groups occurred at the beginning of the study during the period when patients had greatest disease activity, however, the total dose used equates to the use of very low-dose oral prednisolone, with the calculated additional prednisolone equivalent of 0.67 mg/day in the IFX and 0.89 mg/day in the intravenous steroid groups averaged over the course of the study period. In general, in our study, both treatment strategies were well tolerated with no unexpected AEs. Proportions of serious infections were low with two cases (3.6%) in each group. The types of infections were similar to those seen in clinical practice and described in registries 37–39 with one case of tuberculosis in the IFX group, three pulmonary infections (one in the steroid and two in the infliximab groups) and one gastrointestinal infection in the intravenous steroid group. One case of herpes zoster manifesting as a Ramsay Hunt syndrome was recorded in the intravenous steroid arm. SAEs (excluding admission for procedures unrelated to the RA or study treatment) were similar between the two groups. Cost considerations need to be borne in mind when treating patients with RA. Identifying factors associated with rapid clinical and radiographic progression may help to identify those who may benefit most from more intensive therapies. In this study, a posthoc analysis suggested less radiographic progression in seropositive patients in the IFX group compared with those receiving intravenous steroid. Our study has its limitations, in particular that relating to missing data. The potential effect of the missing data, in particular on the lack of difference in radiographic progression between the two groups, has been carefully considered. Using MI to account for this, the adjusted means for progression at week 50 were consistent in the MI and CC datasets (1.45 and 1.21, respectively). Both were lower than the value used to power the trial (three units), and were within measurement error (two units). The secondary and exploratory outcomes were complete in >90% of patients assuming non-response in those who withdrew. These too revealed no substantive differences between the groups. Both groups also progressed radiographically less than expected, and progression was accounted for by a minority of patients as is often the case. Median (IQR) change in the IFX group was 0.11 (0.00, 1.55). In the intravenous steroid group this was 0.65 (0.00, 2.37) which is comparable to the change recorded in patients treated with IFX in the BeSt study (0.50 (0.00, 2.30)).13 Based on the unadjusted results of this trial (a difference of 1.93 in change in observed TSS at week 50) we have calculated that even a study twice the size using these two intensive treatment strategies, would not show a significant difference in the primary outcome, and that the changes seen would still fall within the calculated smallest detectable difference of two units and, therefore, not represent a clinically meaningful difference. Although no increase in AEs was seen with intravenous steroid, bone density was not measured as a specific outcome during the study. According to the protocol, osteoporosis prophylaxis would have been administered at the treating physician's discretion and guided by local guidelines. From this study, we are also unable to compare benefits of different routes of corticosteroid administration which may be more widely used in clinical practice, and to those which have been used in recently published studies.35 ,36 There may potentially be less difficulty with tapering and stopping given intravenously rather than orally. In summary, our study demonstrated that first-line treatment of RA with MTX + high-dose intravenous steroid, together with a treat-to-target approach, resulted in effective disease control with little structural damage. MTX + IFX was not significantly superior in inhibiting radiographic progression although a trend towards earlier responses with significantly earlier achievement of DAS28 remission and better synovitis reduction on ultrasound was seen. The differences in long-term benefits, including effects on bone and cardiovascular risk, between these groups remain to be determined. We would like to acknowledge the research staff at all the study sites, in particular David Pickles for his help and support. We would also like to thank Sarah Fahy for her administrative support, and Ged Conolly-Thompson, Andrea Paterson and Jonathan Thompson for their IT support.
. Structural damage is reduced by early achievement of clinical remission. Arthritis Rheum 2012;64:S437.
. Treatment of early rheumatoid arthritis: a randomized magnetic resonance imaging study comparing the effects of methotrexate alone, methotrexate in combination with infliximab, and methotrexate in combination with intravenous pulse methylprednisolone. Arthritis Rheum 2007;56:3919–27.
. Anti-tumour necrosis factor-alpha therapy over conventional therapy improves endothelial function in adults with rheumatoid arthritis. Rheumatol Int 2006;26:1125–31.
. Presentation and analysis of radiographic data in clinical trials and observational studies. Ann Rheum Dis 2005;64(Suppl 4):iv48–51.
. American College of Rheumatology/European League Against Rheumatism provisional definition of remission in rheumatoid arthritis for clinical trials. Arthritis Rheum 2011;63:573–86.
. Can flare be predicted in DMARD treated RA patients in remission, and is it important? A cohort study. Ann Rheum Dis 2012;71:1316–21.
. Equivalence of the acute phase reactants C-reactive protein, plasma viscosity, and Westergren erythrocyte sedimentation rate when used to calculate American College of Rheumatology 20% improvement criteria or the Disease Activity Score in patients with early rheumatoid arthritis. Western Consortium of Practicing Rheumatologists. J Rheumatol 1999;26:2324–31.
. In early rheumatoid arthritis, patients with a good initial response to methotrexate have excellent 2-year clinical outcomes, but radiological progression is not fully prevented: data from the methotrexate responders population in the SWEFOT trial. Ann Rheum Dis 2012;71:186–91.
. Retardation of joint damage in patients with early rheumatoid arthritis by initial aggressive treatment with disease-modifying antirheumatic drugs: five-year experience from the FIN-RACo study. Arthritis Rheum 2004;50:2072–81.
. Adalimumab added to a treat-to-target strategy with methotrexate and intra-articular triamcinolone in early rheumatoid arthritis increased remission rates, function and quality of life. The OPERA Study: an investigator-initiated, randomised, double-blind, parallel-group, placebo-controlled trial. Ann Rheum Dis 2013.
. Infections in patients treated with tumor necrosis factor antagonists: incidence, etiology and mortality in the BIOBADASER registry. Medicina clinica 2011;137:533–40. Correction notice This article has been corrected since it was published Online First. The DAS44 and DAS28 values in the ‘Efficacy and safety outcomes’ section and the DAS44 value in the ‘Discussion’ section have been corrected. Contributors The study was supported, in part, by a research grant from Investigator-Initiated Studies Program of Merck Sharp & Dohme Limited. The authors had sole responsibility for data analysis and manuscript preparation. Funding The study was supported in part by a research grant from Investigator-Initiated Studies Program of Merck Sharp & Dohme Limited. The authors had sole responsibility for data analysis and manuscript preparation. Competing interests AWM has received grant funding from Merck. DVDH has received consultancy fees from AbbVie, Amgen, AstraZeneca, BMS, Centocor, Chugai, DaiiChi, Eli-Lilly, GSK, Janssen Biologics, Merck, Novartis, Novo-Nordisk, Otsuka, Pfizer, Roche, Sanofi-Aventis, Schering-Plough, UCB and Vertex. EV has received consultancy fees from AbbVie, Amgen, Bristol-Myers-Squibb, Janssen and UCB. JLN has received speaker bureau fees for UCB. MHB has received honoraria and been on advisory boards for AbbVie, BMS, Roche-Chugai, Pfizer and UCB. PE has been on advisory boards and received honoraria from AbbVie, BMS, Merck, Pfizer, Roche-Chugai and UCB. PGC has done speaker bureaus and been on advisory boards for BMS, Janssen, Pfizer and Roche. RJW has received honoraria from AbbVie. Ethics approval Northern and Yorkshire MREC, Sunderland Teaching Primary Care, Administration Corridor, Ryhope Hospital, Ryhope, Sunderland, SR2 0LY, UK. Registration The following are the registration numbers and names of trial registries: Eudract-2005-005013-37; ISRCTN48638981 (http://www.controlled-trials.com/ISRCTN48638981/idea).